WEEKLY LAWN MAINTENANCE: (weather permitting in March through end of season as long as the weather will allow us) Grass will be cut to 2 ½” in height. Remove all heavy clippings. Weed whack in areas mower can not cut neatly. Edge around the entire property 1-2 times per month depending on specific need of each individual property. Blow entire property free of debris. SPRING CLEANUP: Remove all leaves, sticks, branches, etc. Power blow lawns, beds, etc. Cut grass at 2” cutting height so the lawn will be ready for all and any applications that may be applied. FALL LEAF CLEANUP: November 1st through December 15th. Remove all leaves bi-weekly until all removed. Grass will be lowered to 2” for the winter months. Blow property free of all debris. Call office for more details and to schedule yours today! MULCH: Installation of triple shredded, dyed black, or dyed red mulch at reasonable prices upon request. Call for details. TRIMMING: Trim all bushes, cleanups beds. Blow and remove debris from property. 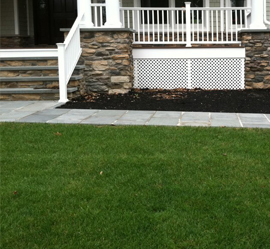 Billed when work performed (call for quote). Call office for more details and to get a free quote today! DE-THATCHING AND SEEDING: Homeowners commonly attribute lawn problems to insect problems, insufficient fertilization, or even diseases. But actually what is happening is the top few inches (10 cm) of soil become compacted. 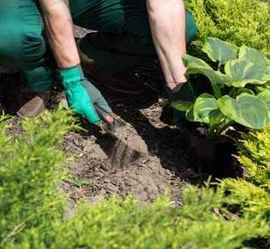 Nutrients, such as water and air, have a difficult time reaching the roots of your lawn. In this case, the grass on the surface may begin to die or show signs that can easily be misdiagnosed. 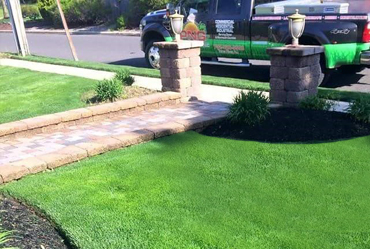 The thatch on your lawn can be your biggest hindrance in growing a vibrant and healthy lawn. If your lawn is left untreated it will result in a lot of your time and effort wasted for a minimal result. A common remedy for this problem is to de-thatch your yard. With thatch removed, air, water, nutrients, herbicides and pesticides can do their job. Turf becomes healthier and more resistant to insect damage and disease. When we de-thatch we use a de-thatching machine that has numerous vertical blades that can cut into the surface of your lawn and soil. 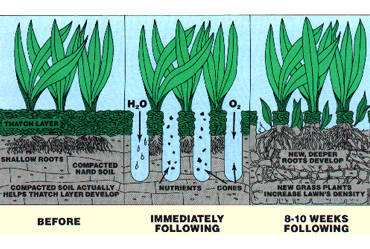 The process also allows oxygen levels in the soil to increase, thereby helping the roots grow. When de-thatching to remove the layer of compacted roots and mosses, it is also a common suggestion to seed your yard. After de-thatching we seed your property and the seeds will fall in and around the slices that the de-thatching machine made. The seed will take better if done immediately afterwards. PNG is awesome! Very professional workers and the office staff is very accommodating! Reliable, prompt and easy to work with. We have been long time customers of PNG and have been very satisfied. 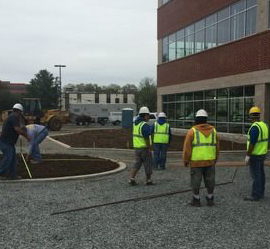 The crews are always on time during our weekly cutting and are quick and efficient. We appreciate everything they do for us! This is a great company!! They have done many jobs for me along with taking care of my weekly lawn maintenance. PNG made my last homes back yard a complete resort. They have now made my new home an even better Oasis. They are very fairly priced. Show up when they say are going to. And live up to everything they promise. I have multiple businesses myself and know how important all of these qualities are. I without hesitation would recommend this company!! 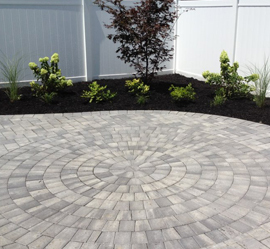 PNG Landscape Design - 30 Years of Lawn Maintenance & Landscaping Services in Toms River and Ocean County, New Jersey.